At McClain Printing Company, we offer a variety of services to help authors bring to life what they have imagined seeing on a book shelf. 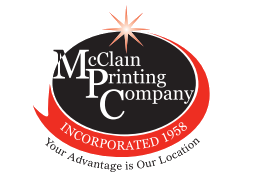 McClain Printing Company has two divisions: Commerical Printing and Book Publishing and five departments produce the work for these divisions. 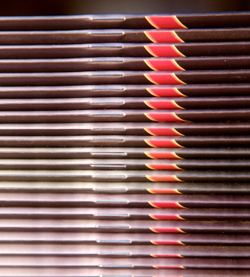 Pre-press is responsible for all type-setting, preflight, impositon, proofing and platemaking for the presses. The Press Department boasts two presses made up of two and five-color Heidelbergs. Once the pages and covers are printed, the sheets go to the Bindery Department where the pages are folded into signatures (in most cases one sheet of paper becomes eight or sixteen pages in a book) and then it is bound. We offer saddlestitching, perfect binding, GBC, plastic spiral, wire o-binding and hardcover binding. The books are then boxed and made ready to be delivered by our Shipping Department or picked up by the customer. Bookkeeping keeps track of all paperwork, invoicing, payments, taxes, etc. All of this work is done by a professional, experienced staff who takes pride in the work they produce. The Book Publishing Division offers special services to authors such as assigning each book an International Standard Book Number (ISBN), ordering a Library of Congress Control Number, supplying authors with the copyright forms once the book is printed and then aiding the author in marketing his/her works. Marketing is obviously the key to successfully selling a book. As with any product, whether an author is well-known or a first-timer, the more people hear about your book, the more likely they are to buy it. We suggest that authors write a brief synopsis of their book and send it to various newspapers and local television and radio stations for reviews and possible interviews. Book signings are a fun, easy way to get to know your public and talk about your book. Take copies with you in your car and stop at small book stores and tourist sites to show them your product. Your interest and enthusiasm for selling the book is crucial. McClain Printing Company will arrange book signings at bookstores and malls at the author's request. But while the author is busy selling his/her wares, MPC will make all the connections on our list to make our dealers and distributors aware of your book. We are a vendor with Waldenbooks/Borders, Barnes and Noble, and Amazon.com, and our primary distributor is Baker and Taylor. We notify all of these national chains about your book as well as R. R. Bowker who publishes the essential book listing, Books in Print. This does not mean that these chains will stock each of their stores with copies of your title, but it does mean that if someone comes into their stores and asks for an author's book, by the author's name, title or the ISBN, they can look it up on their computers and order it from us. Most chains will not order directly from an author and insist on getting their stock from vendors such as MPC, thus we usually purchase a limited number of copies from the author for resale at a 60% discount from the retail price of each book. In turn, the dealers and distributors to whom we sell receive a dealer discount from us. This is why we suggest that an author who publishes privately should take the amount of dollars he/she has in each copy and multiply it by four to help him/her determine a reasonable retail price so that the author doesn't lose money when they sell to dealers.